The morning after that night! 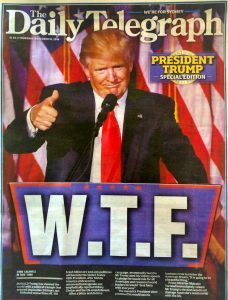 When even Murdock’s “Daily Telegraph” leads off the day after the American election, with the letters “W.T.F” in 72mm high characters in reaction to “a political triumph that seemed impossible 24 hours ago“, you know something major has happened. 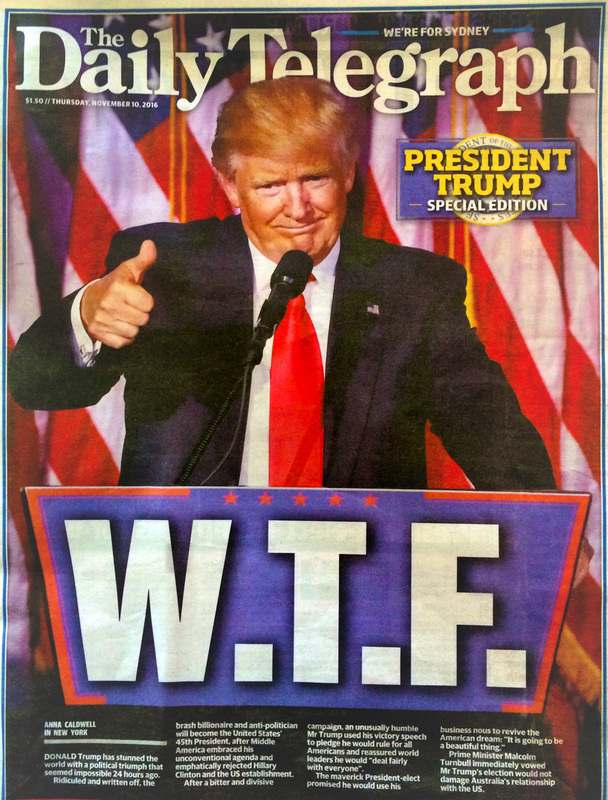 Mind you, given how supportive Murdoch’s media influencers in Fox News was initially for Donald Trump, it is disingenuous for the Telegraph to be milking the global shock reaction. But of course, the Telegraph knows such a response will sell papers, and as usual the profit motive “trumps” ideological approval of the result. 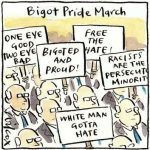 Turnbull very quickly – as he does so often – capitulated to the ultra-right and affirmed his alignment with the new administration. Two rather interesting and telling reactions to the growing realisation that Trump would win were the markets plummeting and the Canadian immigration website collapsing. While the markets have made something of a recovery there is an element of nervousness in the future because of his unpredictability. In regards Canadian immigration website, one can only infer Americans began immediately exploring their options at leaving America. Like our Australian Census website, the canadian site was not built to withstand so much “natural” traffic and failed. When my Father was alive, he made a number of efforts to have myself and my family relocate back across the border from NSW to Queensland. As he pointed out on one occasion that over a thousand people a week were moving up to Queensland from New South Wales. Like the appeal now to moving to Canada, my Father promoted it as the choice sane, rational and smart people were making. I agreed with him, at which point he joyously reveled in his apparent “win”. It was at that point I raised the point that my wife as a psychologist, made a living out of treating dysfunctionality. I countered that, the migration of smart and sane people to Queensland meant greater opportunities for my wife to ply her trade here and less in Queensland. He replied with “Touché!“. And so we stayed put. Perhaps now we should hurry to America. I suspect now the Canadian immigration will be inundated with people contacting them once they restore their website. Certainly, the Chaser, is satirically suggesting that to the south, the Mexican border may now be swamped with fleeing Americans. Trump as the 45th President embraced so wholeheartedly by middle America is fueling anger amongst democrats and socialists in America. But it is not leveled so much at Trump – although some has, as riots have shown – but at an introspection at the failures of the Democratic National Committee (DNC). Many articles reflected that the choice of Hillary Clinton was a choice of the lessor of two evils. Certainly Dr Lissa Johnson’s pre-election analysis did this. In terms of the lesser of two evils, Clinton was not the popular choice, although she was the corporate choice, as evidenced by her significant corporate donors list. It is becoming apparent that many Bernie supporters simply abstained from voting or voted for minority candidates or even switched to vote for Trump. This although was offset by another rather ironic development. Many Trump voters couldn’t vote – as evidenced by the many complaints on the right-wing “4chan” online hangout – because they didn’t register to vote. The sheer irony of the alt-right trolls complaints on the day of voting, that many forgot to register (or didn’t realise they had to) was amusing to some. Clinton – on the other hand – had made ensuring supporters registered was a major part of her strategy, which Trump had largely neglected. Thank the DNC for Trump! The question remains as to what was the offset difference between Bernie voters abstaining or voting for Trump verses non-registered Trump supporters. Certainly the overall effect – whatever it may have been – did not hamper Trump’s success. The Democrats although, created a rod for their own back. The DNC corruptly undermined Bernie Sanders when he clearly had the more popular following but failed to take corporate money and therefore be beholden to them. Hillary gladly accepted her donors and the faustian bargain was completed. She got the nomination. The DNC have only their own corrupt internal arrogance to blame for this failure to beat Trump. Sanders was never behind Trump in the polls, although to be honest the polls did not predict a Trump win. So polling should be approached with large pillars of salt. 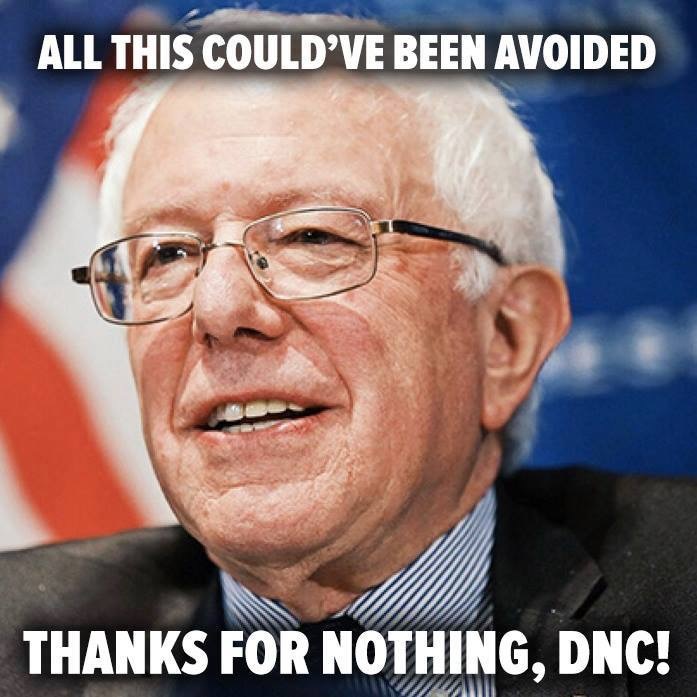 If the final choice weren’t so disastrous, I would say it served the DNC right. 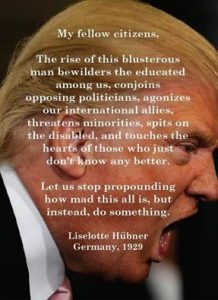 Their arrogant complacency and willingness to bend over to bow to the will of their corporate donors has handed America over to a racist, misogynist, incompetent, liar and failed business man who has run a trail of corporate wreckage behind him. Political party’s need to wake up and start listening to their supporters, not their donors and internal lobbyists and factional politics. It’s the same in Australia. Political donations by corporates are well overdue for review. Exit polls have shown that Trump maintained a strong lead amongst white Anglo Saxon men supported by the conservative religious right. Which leads us into examining the category of folks who had other reasons other than simply rationalising their disillusioned with the performance of the current administration. There is that group of white Anglo Saxon men and women who aligned with Trump’s core values. They who sought to assert their claim to racial dominance and hierarchical social control. As with Australia, many Americans rejected egalitarian pluralism for bigotry, misogyny and racism. 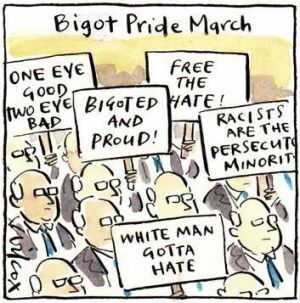 The “right to be Bigots” (as Brandis lobbied for) has been implanted in the moral ethos of three major western democracies. Brexit for Britian, Trump for America and Turnbull’s capitulation to the neo-conservatives of his party for Australia. All the progress in values, morality, fairness and equality which so many folks at the grass roots in this generation witnessed slowly emerging, have been dashed on the shores of hatred, pettiness and division. The blow to egalitarianism that Trump represents has been a crushing blow many are still reeling from. But having been hit so hard we can not stay down. We can not surrender to the hatred. Like the followers of Mahatma Gandhi, Nelson Mandela, Desmond Tutu or Martin Luthor and the like, we have to pick ourselves back up off the ground. We have to face they that defile our hopes and stand for true freedom from oppression, racism, bigotry and misogyny. The battle for a more progressive, egalitarian and inclusive society continues and we cannot let these defeats define us. « Banning Muslims	» Trump – fascist or fascistic?